skills and resources to pursue opportunities in technology. Founded in 2014, Code 441 is a nonprofit started on the island working to expose young people to the technology sector. Our mission is to empower and mentor young people of Bermuda by encouraging them to embrace the current tech marketplace as builders and content creators. 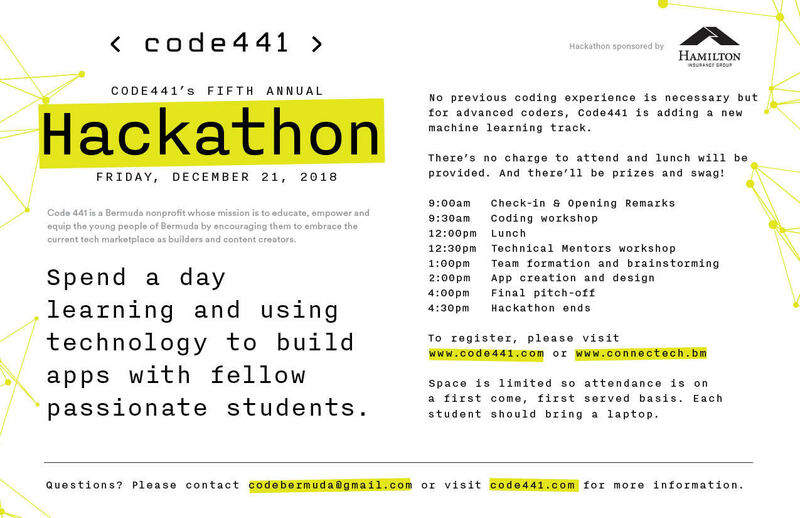 Together with leading educators, engineers, and entrepreneurs, Code 441 hopes to establish a new model for computer science education, web design, and mobile development with focused mentorship and exposure led by the island's top engineers and entrepreneurs. Code 441 empowers the youth of Bermuda through hackathons, mentorships and technology programs across the island. Code 441’s vision is to encourage young Bermudians to explore the worlds of technology. We believe this is important to ensure the prosperity of Bermuda on the global field by using 21st century tools for innovation and social change. We believe that more Bermudians exposed to computer science at a young age will lead to more of them working in the technology and engineering fields. Explore how the web works and the process of building apps. Find out what makes web and mobile applications visually appealing like Instagram. Learn how to include beautiful logos, images and photos into your apps. Study how to save your code online and display it to the world. ©Copyright 2014 - Code 441. All rights reserved.